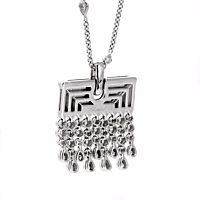 The Chopard diamond tassel drop necklace, elegant and opulent, is an original one-of-a-kind design. The 30" sautoir, crafted in white gold, has a round link chain is embellished with round and pear drop shaped of the finest Chopard brilliant cut diamonds (1.98ct). A rectangular diamond encrusted pendant, enhanced with waterfall diamond columns, comprise the additional 4.34 cts of diamonds in this spectacular piece. 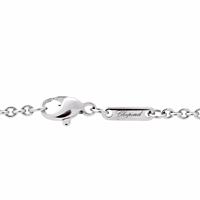 Accompanied by the original document of authentication from Chopard.